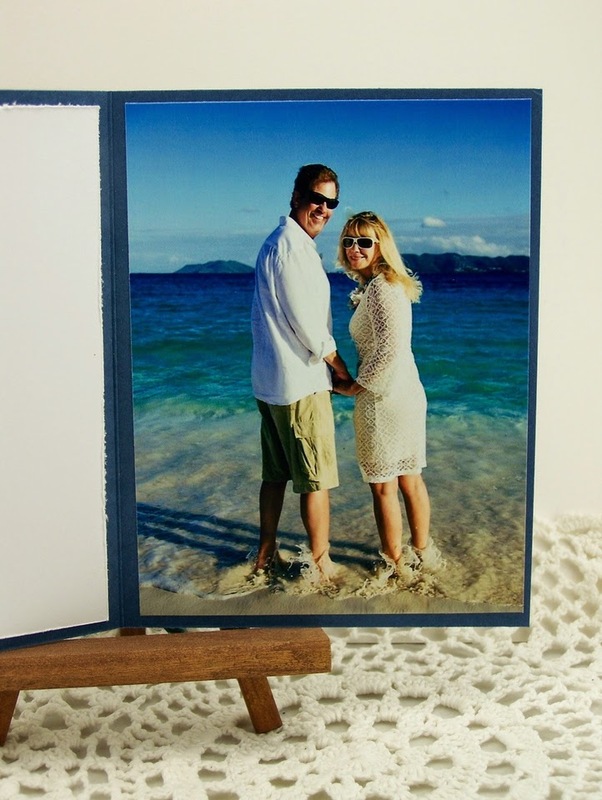 Eclectic Paperie: Happy Anniversary ~ Early! Hi Everyone! It's Sue Lelli here and I made an anniversary card for my DH early because I just received some new products from eclectic Paperie in the mail and I was itching to try them out! I'll just save it until our anniversary in November! LOL! What I WANTED to do was have a starfish in the center cut out with text underneath. It would have been easier if the Tim Holtz alterations sand and sea die cuts had been separate but the weren't. So I improvised! I ended up stacking fat chipboard over the images I didn't want to cut out and running it through my die cut machine. 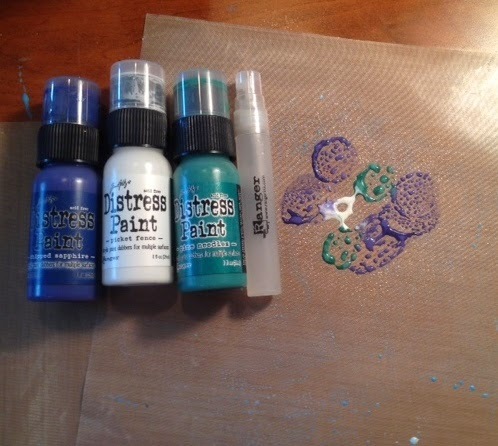 They cut out anyway but there was so much texture and color and product on my Tim Holtz distress watercolor cardstock top page that when I pieced it back together like a puzzle, you really couldn't see it! And I got the look I wanted! 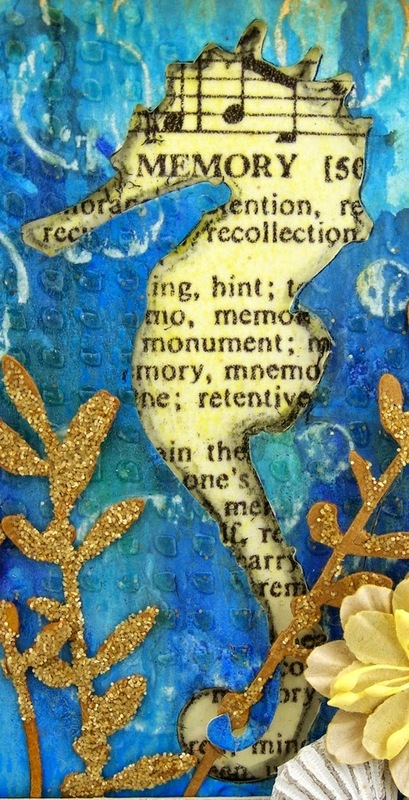 I also wanted the seahorse floating in the water surrounded by bubbles (Tim Holtz texture fades - bubbles and waves) with it's tail wrapped around a plant. That's how they REALLY look when you dive, hiding in plants and blending in to the surroundings. For the plant I die cut a branch from the Tim Holtz spring greenery decorative strip. I put wet glue on it and sprinkled Tim Holtz Distress Glitter on top. LOVE the glimmer it adds! I LOVE this seahorse and I puposely had the word MEMORY show through. (I wanted to remind my DH of all of the FAB memories we have together.) The text is Tim Holtz melange tissue wrap stained with tea dye Distress ink. Here you can see the Wendy Vecchi translucent embossing paste. I LOVE that it dries clear and looks wet on your project! 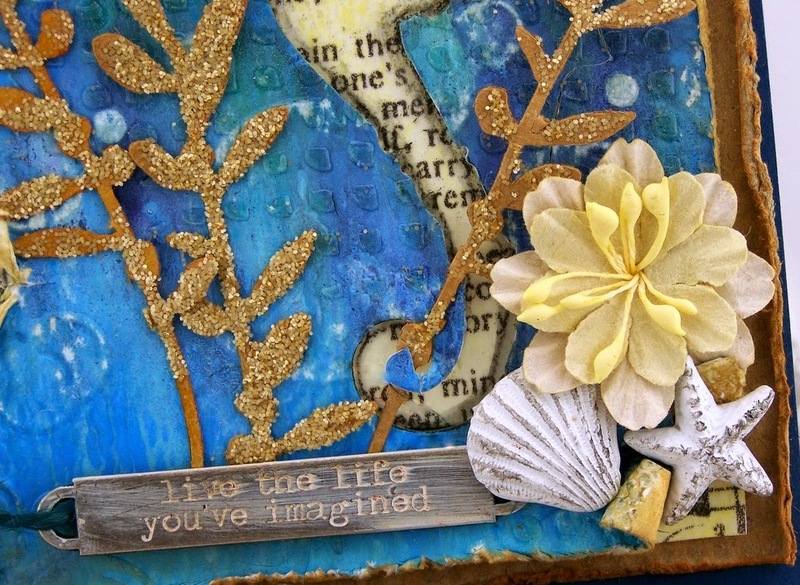 Here you can see the Prima seaweed flower and the Prima resin shells I added. The idea-ology word band sentiment was perfect since this IS an anniversary card and we are living the life we have imagined! Literally! I tied it on with idea-ology jute. The kraft paper behind the watercolor and text layers is my new FAB Tim Holtz idea-ology resist paper. 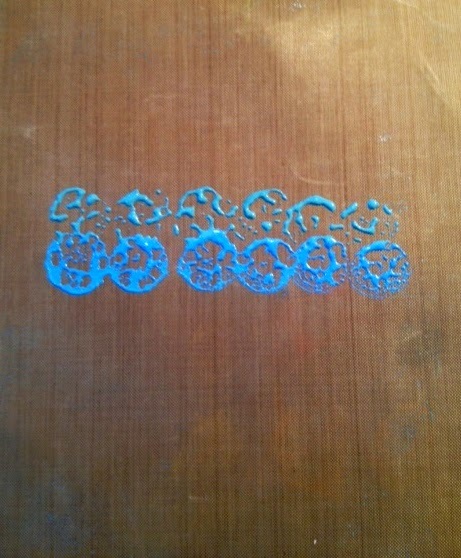 It is so cool with a design embossed on it so when you add ink, the embossing shows through. This one I used has mini distressed dots ~ going with the bubble theme! And on the inside, I put a photograph of last year when we renewed our vows for our 25th anniversary. It was a dream! 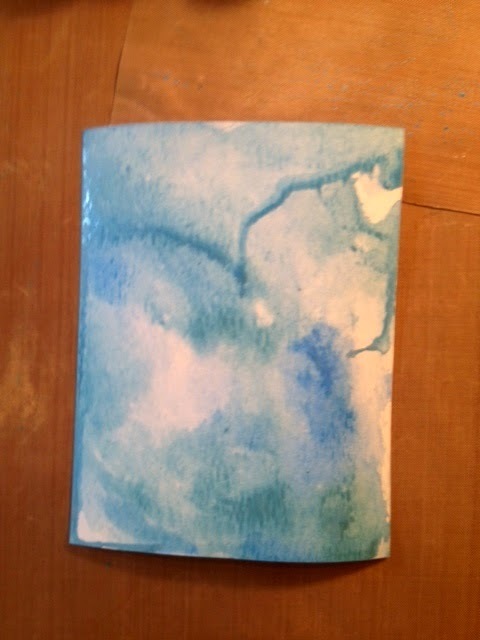 Look at the color of that water and how it is mimicked by the distress paint colors on the outside of my card. 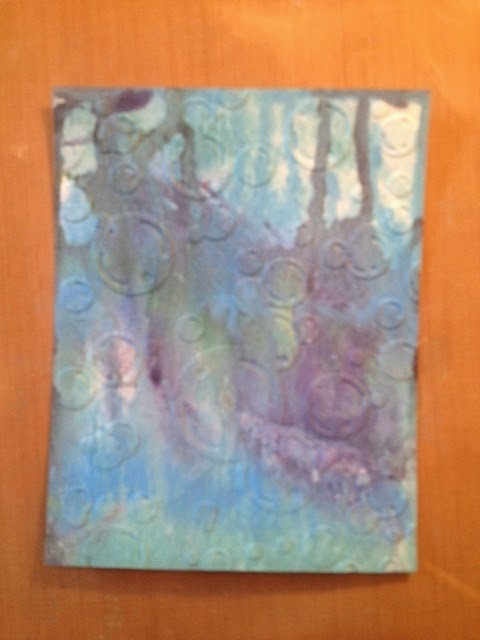 I squished some Tim Holtz Distress Paint on to an inksenssitials craft sheet I have cut to 8x8. (I found it's easier to have several layers of craft sheets so your entire work surface doesn't get dirty ~ just small bits!) Then I spritzed it with a mini mister filled with water. Then twice and this is what I had. 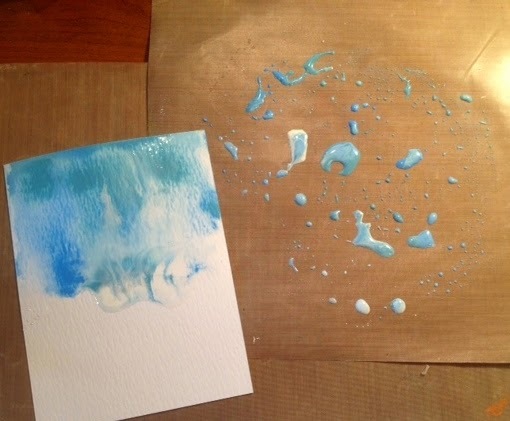 What I LOVE about these Distress Paints is that they react to water when they are wet and you can make them move around but when they are dry, they are permanent and you can add more layers and colors without creating mud. Then I sprayed it again with water from the mini mister. I was happy with the colors but turned it upside down so the drip lines went up. 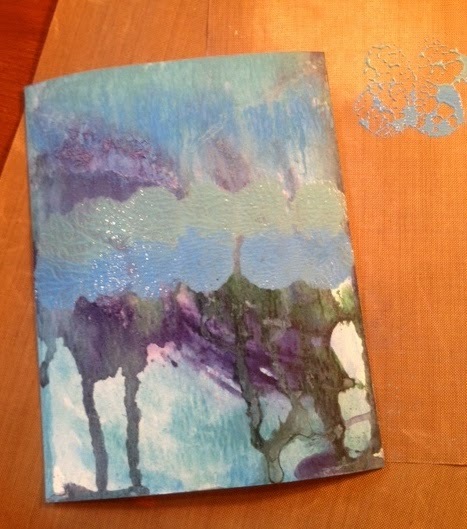 Then I embossed it with my new Tim Holtz texture fades bubble embossing folder. 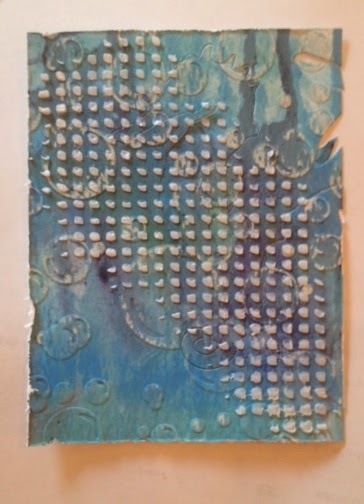 I used the Tim Holtz sanding grip block on top of it to make the bubbles look white and stand out. Here I added Wendy Vecchi's Studio 490 translucent embossing paste through the Dina Wakely plastic canvas stencil. This dries completely clear and made the card front look wet. LOVE that WV translucent embossing paste AND that DW Stencil! Those are all the photos I remembered to take. I got caught up in the creative moment! Love it!! 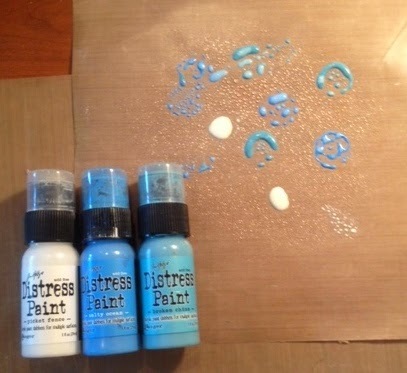 I don't think I use my distress paints enough - they look amazing as the background!! And the seahorse is amazing - your card just makes smile and wish I could jump into my art room and play today!! 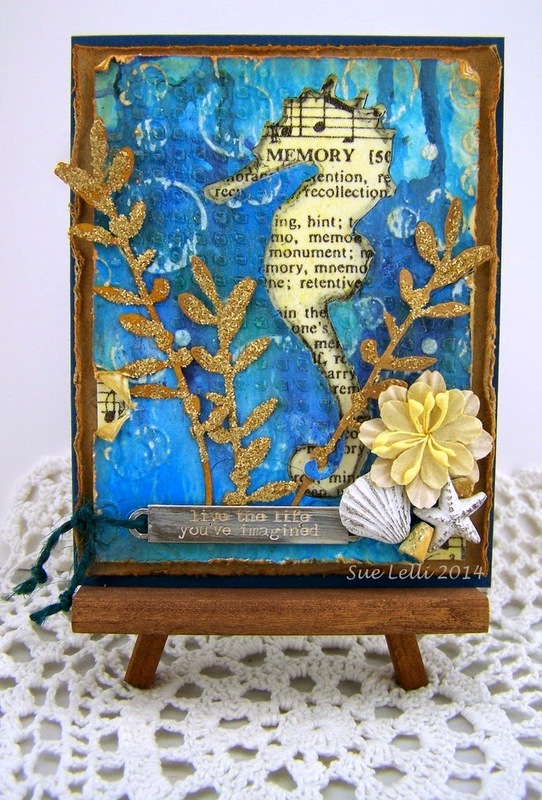 What a lovely ocean theme anniversary card you created Sue! The text behind the cut out seahorse looks wonderful!